Engineer/producer Chris Jones at his Florence, Kentucky-based Stonehand Studio, pictured with some of the gear he has acquired through GC Pro. WESTLAKE VILLAGE, CA, September 12, 2012 — When Chris Jones does something, he doesn’t do it halfway. The engineer/producer is about to open his own music studio in Florence, Kentucky, near Cincinnati, and he spent considerable time and effort researching how to achieve what he wanted in the way of sound. Jones’ wish list was long and detailed, but it was just what Guitar Center Professional (GC Pro), the outside sales division of Guitar Center that focuses on the needs of professional users, loves to do: help audio professionals bring their visions to life. Stonehand Studio, which will open in the fall of 2012, is conceived by Jones as a natural-sounding space where acoustics and technology combine to create a wholly organic ambient environment for music recording. “I want it to be a place where people will enjoy taking their time, choosing microphones and picking mic placements to get exactly the sounds they’re looking for,” he explains. Stonehand’s equipment list was put together to help achieve what the studio’s acoustics will bring about naturally, and Jones has a clear rationale behind each piece. For instance, he says he selected the Vintech 473 4-channel mic preamplifier because it approximates the sound of vintage Neve pre amps, and the API 3124+ 4-channel mic pre for what it brings to drums, guitar amps and vocals. Jones researched these and other specific pieces of gear, looking for the combinations that would give him the kind of sonic sensibilities he wanted, but he also consulted with the GC Pro office in Cincinnati, where Account Manager Jim Kinney helped Jones narrow his choices, sourced products and helped him get competitive prices. And when the time came, they also helped commission the studio, too. Marcin Nowak with GC Pro Technical Services handled the Pro Tools 10 software and Universal Audio Nevana software installations, PCIE card installation, Apogee Symphony installation, RAM upgrades and Apple Mac Pro computer set-up and registrations. GC Pro’s Pres Maxson was invaluable behind the scenes, making sure all the pieces were ordered correctly and arrived on time. 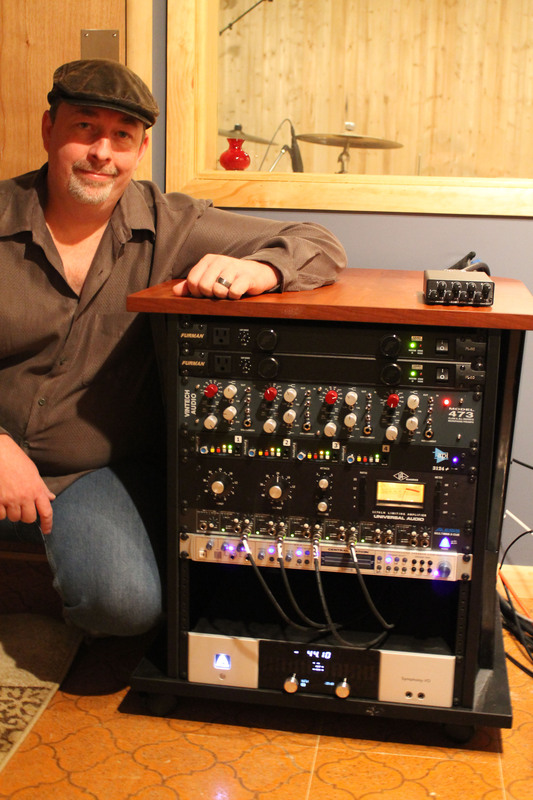 Photo Caption: Engineer/producer Chris Jones at his Florence, Kentucky-based Stonehand Studio, pictured with some of the gear he has acquired through GC Pro.